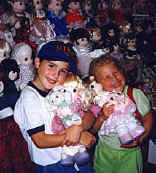 Browse the Catalog--See the catalog pages of all the Precious Moments Dolls! Over 600 Items-- Complete with pictures, descriptions & prices! How to take care of your dolls? Have you been looking for Precious Moments Figurines? Want more Precious Moments figurine information??? Click Here! READ "WHY SHOULD YOU LIKE PRECIOUS MOMENTS?" HELP! I can't find anything on this website!! Want YOUR OWN SUPERSTORE SITE JUST LIKE THIS ONE? Click Here to Print the LAYAWAY FORM! Who Is Meglan Marketing & PM Merchdise? Why should you like Precious Moments?! Read "How I learned how to get the power of FAITH in my life"
READ "LIFE IS FULL OF PROBLEMS"
I would like to receive responses to my Request. I wish to subscribe to the PrayerWeb newsletters and participate in the prayer chain. NOTE: If you are NOT currently a registered member of GCN, you will automatically be registered with Global Christian Network. GCN services are free!